It's the New Year and everyone in Angel Lyceum is hard at work, preparing for the annual New Year Food Fest, an occasion for like-minded food-tasters and merry-makers! Gracing this year's event is Grande Chef, a renown chef that breaths magic and life into his dishes! Only one small problem: Super Seasoning, one of the key ingredients in all dishes has fallen in short supply! Grande Chef is offering to whip up some special dishes for anyone who helps to gather the Super Seasoning. Here's the chance for you to satisfy your taste buds! During the event, a new NPC Grande Chef will appear in all 4 main cities. Gather some Super Seasoning and approach Grande Chef and he will reward your efforts with a magic-enhanced dish! Super Seasoning can be found or gathered from Level 21 or higher monsters and Level 21 or higher resources. Curry Chicken Soup Increase Attack by 120. Lasts 30 minutes. Tomato with Meat Soup Increase Spell Attack by 96. Lasts 30 minutes. Tender Mutton Soup Increase Magic Damage to target by 5%. Lasts 30 minutes. Cream of Pumpkin Soup Increase manufacturing by 12%. Lasts 30 minutes. Red Wine Beef Soup Increase Physical damage by 5%. Lasts 30 minutes. Seafood Clam Chowder Soup Increase Collection speed by 12%. Lasts 30 minutes. There is a rare type of seasoning known as Top-grade Seasoning. Dishes made with Top-grade Seasoning enhances the magic properties of the dish and gives it an extra flavor for a satisfying meal! With such properties, it is no wonder that even the gods fight over food! You can find Top-grade Seasoning in the Item Mall. 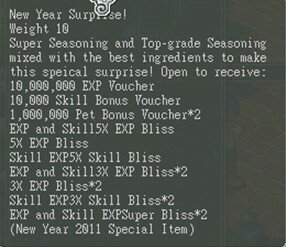 Ingredients needed to create the New Year Surprise: 25 Super Seasoning and 1 Top-grade Seasoning. We regret to inform that the New Year Food Fest 2011 has expired. NPC Grande Chef will be on his way after the week's server maintenance on January 27.